Fortunato No. 4 has everything which makes chocolate so emotional and beautiful. 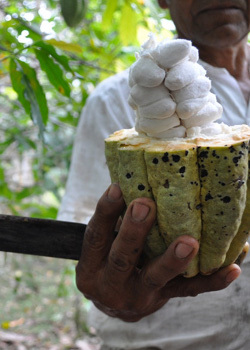 The genetics, which are one of a kind in the world of cacao. A fair cooperation with the cacaotieros in the valley. From supporting them with knowledge and tools to the premium price paid for wet beans. A quality control which starts with the harvest of the fruit and ends with the best chocolate manufacturer in the world. A sublime chocolate experience, which carries you for a brief moment into another, more beautiful world. "Your Fortunato products transmit a kind of taste sensation which I have never experienced before. Minutes after relishing the taste, a feeling remains on the pallet as if one has just enjoyed a piece of pure luck. Fortunato does not tempt you to gorge, but rather leads you to an enjoyable contemplation."